Not every fireplace tool set can be trusted to keep your fireplace working properly. However, Minuteman can fulfill this responsibility with a 5-Piece - Shepherd's Hook III Fireplace Tool Set. 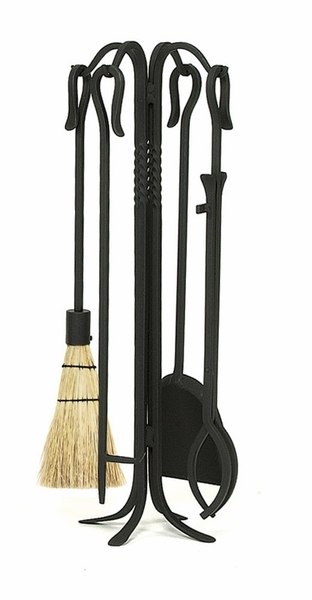 This 26 1/2 inch set comes with a stand, a poker, a hefty shovel, a pair of tongs, and a broom-just the right tools needed to maintain a clean fireplace. This set features the third variation of the shepherd's hook design, has a black powder coat, and is made of iron. How tall are the actual tools? The description doesn't specify if the measurement given is for the tools or for the stand. Thank you for your patience. Per the manufacturer, the actual length of the tools is 28".